The Express Backpack 2.0 was specifically re-designed to comfortably carry your laptop computer and give you the extra room that you need for your books and accessories, as well as an integrated tablet pocket to hold your iPad or tablet! The Express was designed from the start as a better way to carry your computer and gear! 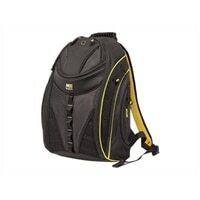 This pack from the ergonomic straps and ventilated back panel to the protective computer compartment, to provide great functionality and user comfort. If you enjoy the freedom a backpack offers, this is the one for you!